Back in 2005 I discovered that Giorgione’s Tempest had a “sacred subject”: The Rest of the Holy Family on the Flight into Egypt. In May, 2006 a short interpretive essay appeared in the Masterpiece section of the Wall Street Journal. 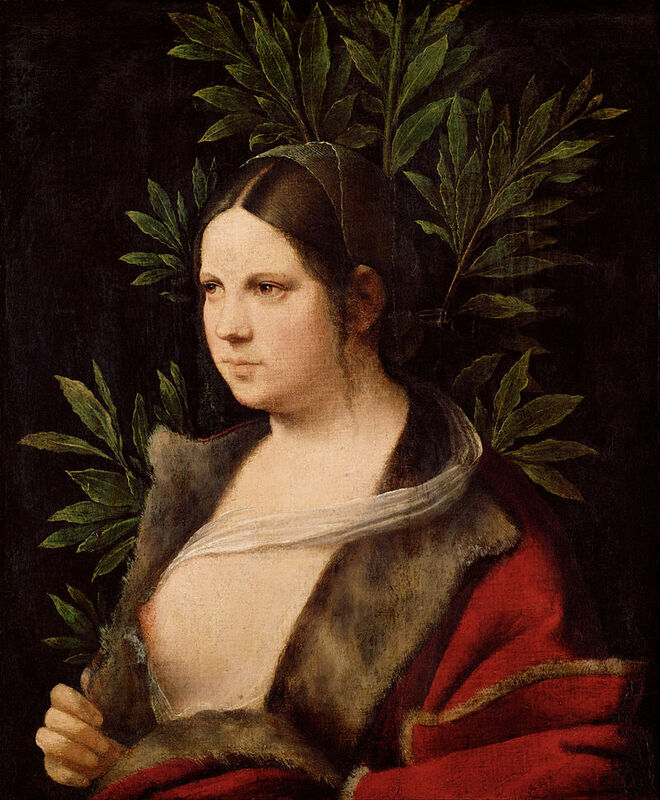 In 2010 I presented a full paper on the subject at the annual meeting of the Renaissance Society of America held in Venice that year on the five hundredth anniversary of Giorgione’s death. 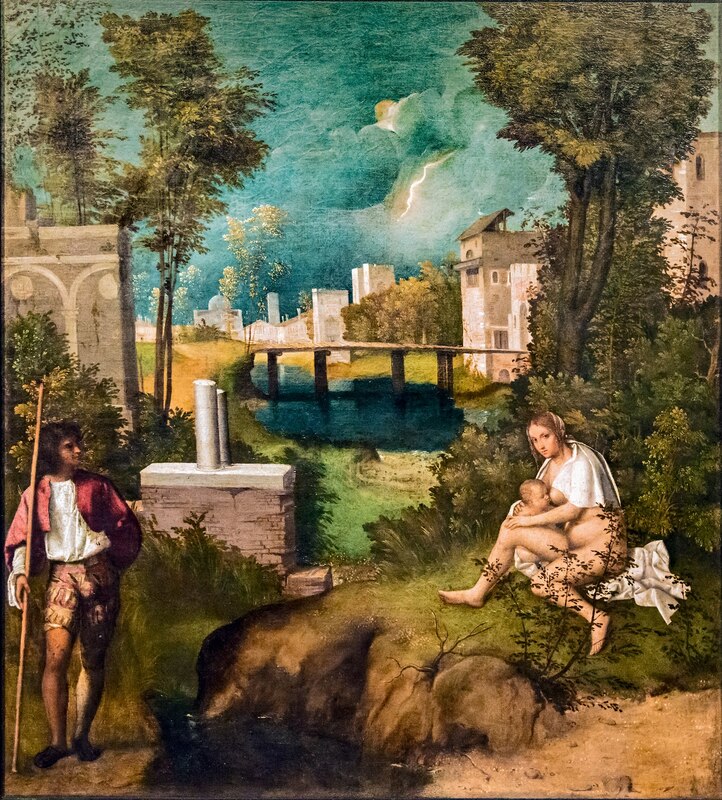 Incredibly, the Tempest discovery led to a number of other discoveries that indicated that many of the most mysterious paintings of the Renaissance also had “sacred subjects”. 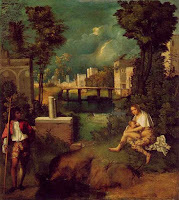 In 2010 after failing to get any interest from academic publishers, I decided to publish my work on a website, MyGiorgione. 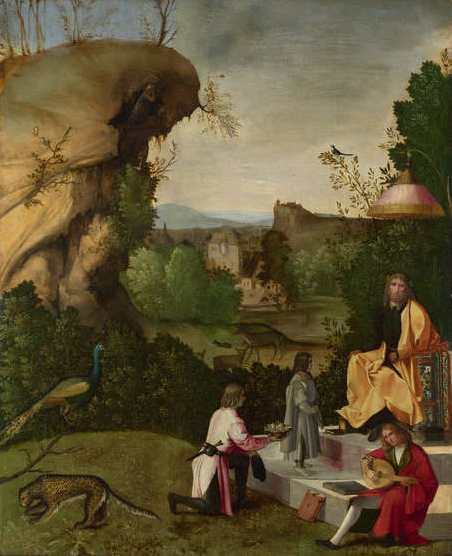 I also began to use Giorgione et al… for more informal articles on Giorgione and others. This year I have reprised about 20 of these articles. In the first half of the year I concentrated on different aspects of the Tempest itself like the Man and the Woman whom I had identified as the St. Joseph and the nursing Madonna. I also included essays on the broken columns, the solitary bird on the roof, and the storm in the background. I even reprised my essay on the pentimenti. 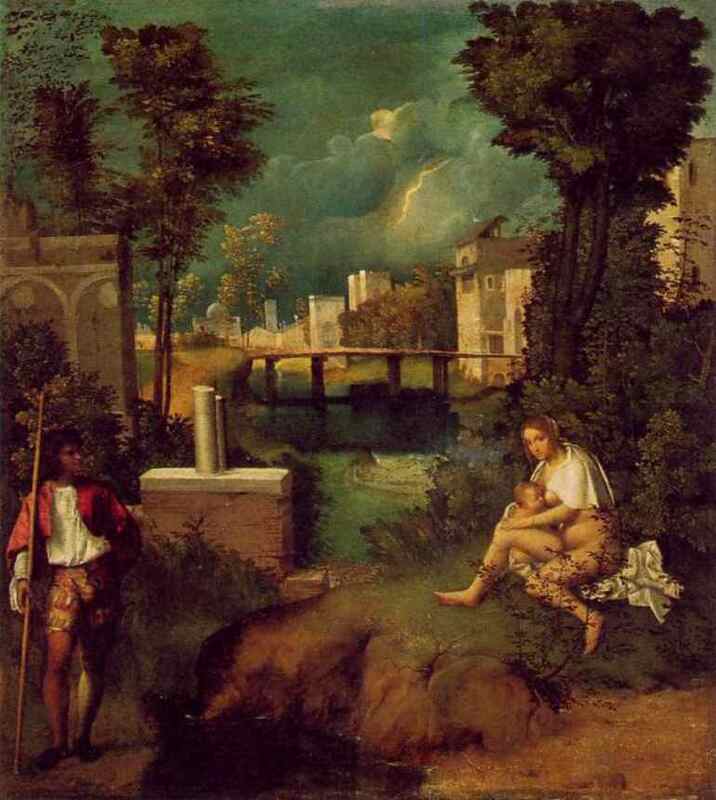 I used the summer for some posts on background issues like Venetian humanism but in the fall I reworked a series of earlier posts on other Giorgione paintings. Here is a brief listing. Judith:This painting of the Jewish heroine Judith with her bare leg atop the head of the defeated enemy general Holofernes is regarded as a ground breaking work. In a September 9 blog post I discussed the reason why Giorgione might have bared the leg of the victorious Jewish heroine. Homage to a Poet:In a September 28 post I revisited my interpretation of this mysterious painting that has been called any number of things. I still believe that it should be regarded as Giorgione’s version of the Man of Sorrows, an extremely popular sacred subject of the time. Three Ages of Man: On October 14 I once again offered my interpretation of this painting as The Encounter of Jesus with the Rich Young Man. 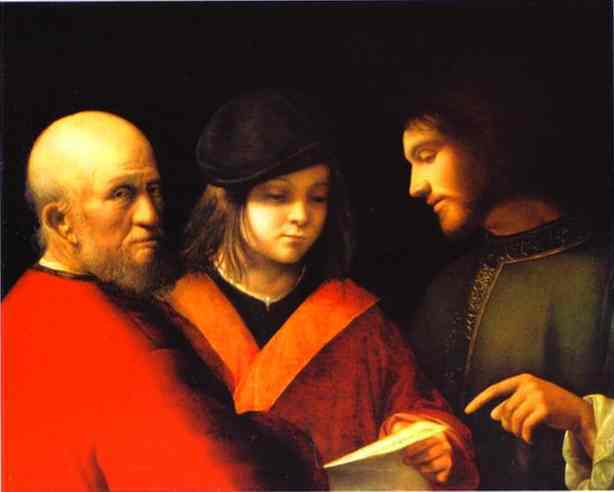 Most scholars can’t see it but ordinary Catholics easily identify the man on the right in green as Jesus and the young man in the middle as the wealthy young man of the gospel account. 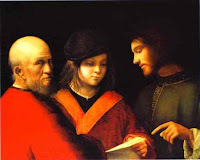 The man in red must then be St. Peter the only other individual mentioned in St. Matthew's account. 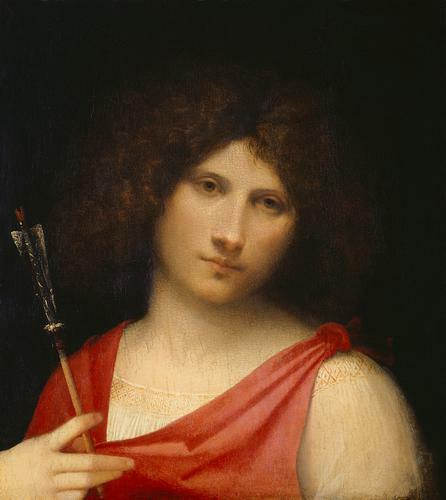 Boy with an Arrow: In an October 28 post, I offered my reasons for identifying this painting as Giorgione’s version of St. Sebastian.The painting is remarkably similar to a depiction of the saint by Raphael but Giorgione characteristically removed obvious iconographical details like the halo. Instead, he used one simple arrow, the color of the young man’s tunic, and the angelic face to recall the martyr. The Three Philosophers: On November 16 I again agreed with those who see the Magi in this famous painting. 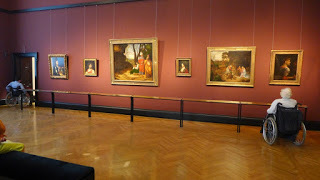 It now hangs in Vienna’s Kunsthistorisches Museum alongside the Boy with an Arrow, and the Laura. 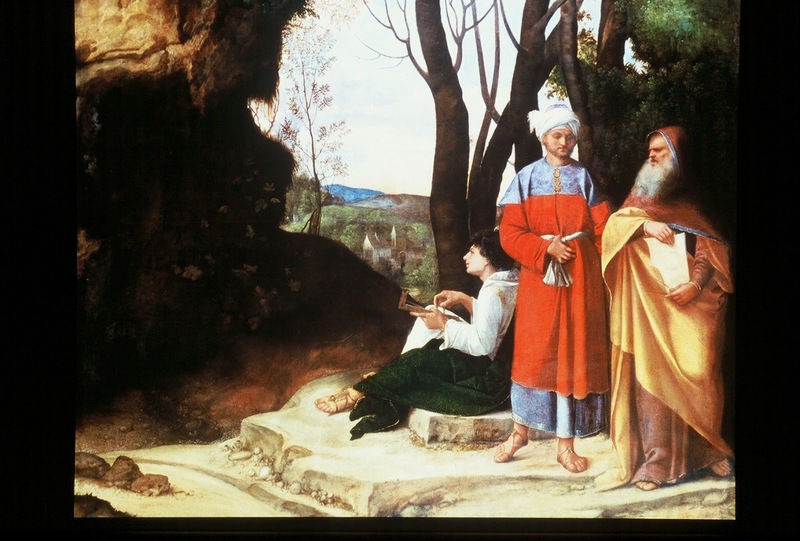 My own contribution to the debate over this painting was to suggest that Giorgione used the colors of the garments of the three men to symbolize the gifts they presented. Laura: On November 24 I once again argued that this painting represents Mary Magdalen. Scholars have been puzzled by this painting because of details indicating a chaste wife on one hand, and a courtesan on the other. Only Mary Magdalen fits that description in the Venetian Renaissance. 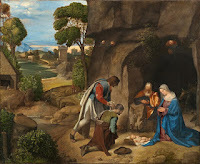 Adoration of the Shepherds: Finally, on December 13 I reproduced my post on Giorgione’s Adoration of the Shepherds. This painting is obviously a sacred subject but I believe that most scholars have failed to see the deep Eucharistic symbolism in this painting with the infant Jesus lying on the ground as Venetians believed he lay on the altar during the Sacrifice of the Mass.